ST. PAUL, Minn., Feb. 23 (SEND2PRESS NEWSWIRE) — On Saturday, March 5, 2011, nearly 600 middle and high school students, teachers, volunteers, parents, and community leaders from around the Twin Cities will convene at Macalester College in St. Paul to participate in Minnesota’s Third Annual World Affairs Challenge™, hosted by global education non-profit World Savvy in partnership with Macalester College’s Institute for Global Citizenship. The theme for this year’s World Affairs Challenge™ is “Food: Feeding the World Sustainably in the 21st Century.” More than 1,200 students from 24 schools around the Twin Cities have been working for the past several months to research and develop solutions to issues as diverse as the environmental impact of food production to the impact of food prices on global hunger. On March 5th, nearly 300 of these students will share their perspectives on these important issues with their peers and adults who serve as observers and judges. Challenge Day, the culminating competition of the World Affairs Challenge™, will kick off at 9 AM in Macalester’s Kagin Ballroom with opening remarks from Minneapolis Mayor RT Rybak followed by a Keynote address from Secretary of State Mark Richie. These leaders will share with students why the work they are doing to develop sustainable solutions to issues like hunger, agriculture and nutrition is so critical. Minnesota is home to over 80,000 farms. While almost 27,000,000 million acres of land is used for agriculture, 1 in 10 people are going hungry in the Twin Cities. There is no question that food is a critical local issue. The World Affairs Challenge presents a unique opportunity for students to study this global issue with significant local implications by exploring a variety of perspectives and working with their peers to develop creative local, national and global solutions. During the day, students will present their research and solutions to judges from the community in the form of formal presentations and visual solutions showcases, on display throughout the day in the Kagin Ballroom at Macalester. Students will also participate in a collaborative problem-solving activity that challenges their teamwork, critical thinking and communication skills. The day will close at 3:30 PM with an Awards Ceremony, where students will receive recognition for their work. World Savvy launched the World Affairs Challenge program in the Twin Cities in 2008 after six successful years in San Francisco. Despite the current economic recession, this program continues to grow in Minnesota and has more than tripled in size over the past three years. Program sponsors include Wallace Genetic Foundation, the Xcel Energy Foundation, the General Mills Foundation, the Pentair Foundation, the Best Buy Children’s Foundation, RSP Architects, and Minnesota Public Radio. For more information, contact KK Neimann at kk@worldsavvy.org or call 612-767-4438, or visit: http://worldsavvy.org/events/minnesotas-third-annual-world-affairs-challenge/ . World Savvy’s mission is to educate and engage youth in community and world affairs, to prepare youth to learn, work and thrive in the 21st century. A national leader in global education, World Savvy provides interdisciplinary academic and arts programs for youth and dynamic professional development for educators to help the next generation of leaders and changemakers acquire the knowledge, skills, and dispositions for responsible global citizenship in the 21st century. 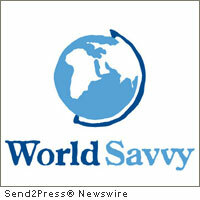 For more information, visit www.worldsavvy.org . Original Keywords: Minnesota Third Annual World Affairs Challenge, Macalester College Institute for Global Citizenship, global education non-profit, hunger, agriculture and nutrition, nonprofit, interdisciplinary academic and arts programs for youth and dynamic professional development for educators World Savvy St. Paul Minnesota ST. PAUL, Minn.
REFERENCES: Education and Schools News, Minnesota Third Annual World Affairs Challenge, Macalester College Institute for Global Citizenship, global education non-profit, hunger, agriculture and nutrition, nonprofit, interdisciplinary academic and arts programs for youth and dynamic professional development for educators World Savvy St. Paul Minnesota ST. PAUL, Minn.